Replacing a doorknob takes only a few minutes. You need a screwdriver and, in some cases, a chisel. Residential doors use a standard hole pattern. Most doorknobs you can buy at home centers will fit your door at home. Doorknobs with locks and deadbolts are installed exactly the same way. Be careful when selecting your door knobs. Some are specifically made for right swing or left swing doors. Others let you reverse the handles making them useful for both types of doors. Make sure you buy the right kind for your application. 1) First the old doorknob needs to come off. Typically there are screws visible on one of the sides. Remove the screws and the two sides of the doorknob will come out. The latch remains in place. 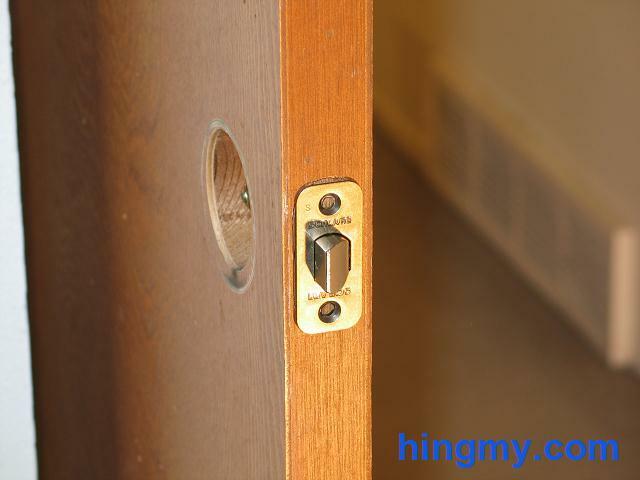 It is held in place with two screws on the jamb side of the door. Remove it. 2) Begin installation by positioning the latch in the door. Make sure the beveled side is facing in the direction the door will close. Otherwise the latch will not operate properly. The latch will either fit into the recess already in the door, or it won't. If it fits, simply screw it into place. If it does not, you will need to enlarge the opening. Hold the latch into place and trace the outline of the latch using a knife or pencil. Use a sharp chisel to remove the excess wood. When the latch fits, screw it into place. 3) Install the new door handles. Push them through the hole in the door. The two sides will lock into each other. Attach them with the screws provided in your kit. Keep in mind that the screws on some door knobs will show. In some cases you can pick which side of the door they will go. I suggest you put them on the side of the door that is less visible, for example the inside of a closet door. 4) At this point you are done, if you do not want to replace the strike plate. If you do, remove it and test fit the new strike plate. If it does not fit enlarge the cutout using the same technique used for the latch. Once the strike plate fits, screw it into place. You are done. The instructions above are for the typical door knob. Some model may be a bit more complicated to install. The basics, however, are the same for all locks.